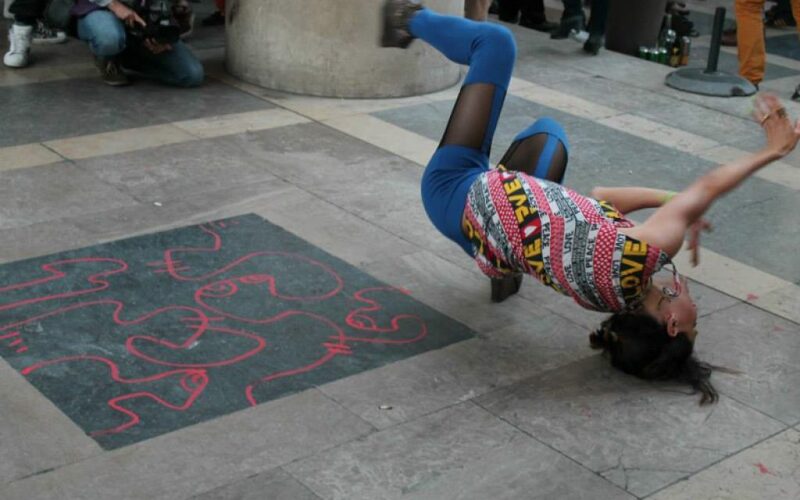 Cécilia Bengolea performance at Palais de Tokyo, Paris, 2015. Resident Cecilia Bengolea will present new work for Art Night London, the first free all-night contemporary arts festival in the UK, in partnership with Delfina Foundation. This new video installation in Covent Garden East Piazza will be developed over the course of Cecilia’s residency at Delfina Foundation and draws on her long-term project of training to enter the International Dancehall Queen competition in Montego Bay, Jamaica. Cecilia’s work combines Jamaican dancehall and classical ballet, created in collaboration with dancehall artist Damion Wallace and ballerina Erika Mivauichi. Cecilia describes dancehall as the punk brother of reggae, an unruly culture where everything is possible: the new work combines the pop culture and academicism of two extremely different languages and worlds and the social signifiers and cultural contradictions that each brings. As Cecilia states: Ballet and dancehall are not supposed to meet in one same body .